The Briggs & Stratton 30552 7500-Watt Gas Powered Portable Generator produces clean and instant power to keep appliances and other important electronics running during a power outage or natural disaster. This unit features a 2100 Series OHV 420cc Engine that produces 21 ft. pounds of torque and a 7.5 Gal. metal fuel tank for an impressive 9-hours of continuous operation at 50% load on a full tank. Features a fuel gauge and hour meter for monitoring gas levels, low oil shutdown that alerts you when oil is low and a Super Lo-Tone Muffler to reduce operating sound. 120/240-Volts and 62.5/31.2 Amps. CARB Compliant. All power levels are stated gross torque at 2600-RPM per SAE J1940 as rated by Briggs & Stratton. CARB Compliant. All power levels are stated gross horsepower at 3600-RPM per SAE J1940 as rated by Briggs & Stratton. The Briggs & Stratton 30552 7500-Watt Gas Powered Portable Generator comes with a 2-year limited warranty to protect against defects in materials and workmanship. Known for hard-working, dependable, efficient products, Briggs & Stratton is the worlds largest producer of gasoline engines for outdoor power equipment. Briggs & Stratton products are designed, manufactured, marketed and serviced in over 100 countries on all seven continents. 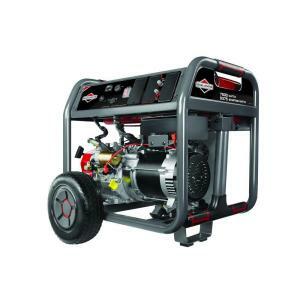 Tbook.com crawls the web to find the best prices and availability on Generators and related Tools and Hardware products like Briggs & Stratton 7,500-Watt Gasoline Powered Portable Generator. For this page, related items include products we find that match the following keywords: "Generator GENERATOR" at our vendor partner Home Depot. Briggs & Stratton 7,500-Watt Gasoline Powered Portable Generator is one of 152 Generators and related products listed in the Tools and Hardware section of Tbook.com If you have any questions on this product, please give us a call at 734-971-1210 during the hours of 9am - 5pm EST for assistance. Thank you for shopping at Tbook.com, the Internet Department Store!